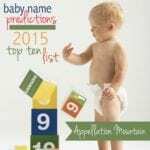 It’s time for Top Ten baby names predictions 2018. Because by this time tomorrow, the Social Security Administration will have released It’s Christmas meets the Super Bowl meets my birthday. No wait, it’s better than that. Because while all of those things are over in a matter of hours, the US Social Security Administration data release is the gift that keeps on giving. We’ll spend days combing through the data to tease out the trends that drive how we name children today. These are the names I’m watching to enter the US Top 100. And my annual Trendwatch 2018 is here – the names I think will crack the Top 1000. But how about that elusive Top Ten? It’s been a snore the last few years, with relatively little change. And really, it’s pretty dull most years. Check out the Top Five names over the years, and marvel at how little changes. Still, after a few years of steady Top Tens, would it be wrong to hope for a little bit of a shake-up? Let’s start with my girls’ guesses. Ava and Charlotte both rose slightly; Emma, Olivia, Isabella, Mia, and Harper were flat. Sophia, Abigail, and Emily all fell slightly. But that obscures an intriguing fact. In raw numbers of actual births, only Charlotte and Harper gained. The rest fell. So why wasn’t there more of a change in the Top Ten? Simple. No other names gained enough to unseat them. This year, I’m banking on Amelia and Evelyn to finally nudge their into the list, almost certainly at the expense of Abigail and Emily. Olivia – Both Emma and Olivia fell in terms of raw numbers in 2016 – but Emma fell more. Emma – Despite being a long-time Top Ten, parents continue to love this simple, literary choice. Ava – I wouldn’t be surprised if Ava rose even higher! Stylish and minimal. What’s not to love? Sophia – A gorgeous name, but it’s slipping – in part because so many parents spell it Sofia. Charlotte – The young princess remains in the spotlight, as does her traditional name. Isabella – This romantic name held the top spot in 2009 and 2010, but has slipped every year since. Mia – Another mini-name like Ava, I think Mia still has plenty of appeal for parents. Somehow we don’t hear as much about Mia as we do about Sophia, Isabella, and Emma. Amelia – Last year’s #11 name, Amelia has marched straight up the charts over the last decade. Harper – This literary surname is slowing down slightly, but still remains a favorite. Evelyn – Tailored, vintage Evelyn stood at #12 last year, meaning that just a small jump in use could take this name to the Top Ten. In terms of actual births recorded, Mason, Jacob, and Ethan all fell in fairly big numbers. Noah, Liam, William, and Michael fell, too, though not as dramatically. Elijah and Benjamin increased in use, while James was pretty much flat. But, as with the girls’ list, the absence of any really dramatic rising names meant that most of the Top Ten remained stable. This year, I’m guessing that Oliver will make the cut, probably at the expense of Ethan. Noah – I’m not sure I see anything unseating this favorite, even though it continues to fall in overall use. Liam – Again, Liam’s peak is in the past – but parents are still mad about this friendly Irish import. William – Speaking of Liam, the longer version of the name proves that classics still appeal. James – Not so long ago, every James was Jim. Now they’re mostly James, and that helps this classic boy’s name feel fresh again. Benjamin – A newcomer to the Top Ten from last year, I think Benjamin is the new Alexander. A longer, distinguished given name with a friendly, upbeat short form. Mason – Even a big drop for Mason probably leaves this name in the Top Ten – for now. Elijah – Like Benjamin, a newcomer to the Top Ten last year, and one that I think will continue to rise. Jacob – A former #1 favorite, Jacob remains a go-to choice for boys. Michael – Classic Michael is another long-time #1 still in steady use. Oliver – A fast-rising name from recent years, I think time Oliver will break into the Top Ten – at last! What names are you watching? 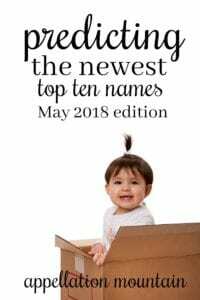 Do you have Top Ten Baby Names Predictions 2018 to share? Leave them in the comments! for The life of me, I cannot figure out where all these little Michaels are, because I’ve yet to meet one under the age of 25. No Mikes, no Micks, no Michaels. Are the all using their middle names? Or does my little part of California just not match up? So strange. Ha! We’ve got them in Maryland. (I’m right outside of Washington DC.) I know a five y.o. Michael and a 13 y.o. Michael. One is named for his dad – not sure if the other one is a family name or not? Guessing the top ten is a much more difficult, and in my opinion therefore fun contest than in previous years, particularly the boy’s list! FWIW, My girls top ten prediction is the same as yours except I have Mia and Isabella flipped. For the boys I had Benjamin up to #4, but I shuffled the last 4 names differently, with Oliver all the way up to #7. IMO it’s a complete tossup what order Jacob, Elijah, and Michael will land in, and I LOVE that. Definitely not boring this year! I think Avery is either going to be on the bubble or enter the bottom have of the Top 10. It’s had such a huge growth over the last few years and it jumping six places isn’t impossible. I know SO many infant Amelias, probably more so than any other name but Zoe. 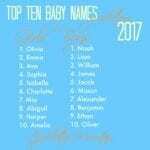 This will be my first year seeing the list of names knowing my 1-year-old will be one of the births under her name…that is its one unique kind of excitement for a name nerd! Can’t wait! I spent many years with naming regret. Not because I didn’t like their names but because as much as I research baby names I couldn’t be more original. But I came to peace with it when my kids were in their teens. The names are popular for a reason. They are beautiful names that many people happen to like. Alex is definitely a Alex. And my sweet Jess has turned into an amazing you lady. I relate to so many people on this blog that agonize over names. I still love baby names. But I have determined the child wears the name and every child is unique. Second that! I love both of those.